VERY RARE 1997 TRENDMASTERS LARGE TRANSFORMING DIE-CAST METAL VOLTRON III LION ROBOT. ALSO THIS ITEM COMES FROM A NON SMOKING ENVIRONMENT. THESE WERE SOLD OUT INSTANTLY WHEN THEY WERE RELEASED MANY YEARS AGO. This is a offically license product. 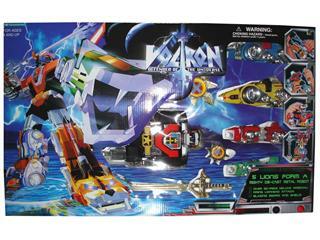 This is not the all plastic version voltrons, not the newly released metallic plastic voltrons, not the new mass released remolded masterpiece voltrons and not the overseas taiwan lionbot bootlegs version, but instead a much more rare USA offically license released version which has been sold out many years ago in the usa. This item was released back in 1996-97. This box set states that it comes with over 20 piece deluxe arsenal and blazing sword and shield. The lions has firing heads as well. The voltron stands approx, 12 inches tall. why buy a opened, played, damage version on ebay, when you can buy this one which is “STILL BRAND NEW FACTORY SEALED AND NEVER OPENED”.